We want our employees to be successful and work with us over the long term. Based on your education, training, qualifications and experience, you’ll take on specialized and project-related tasks along with areas of responsibility established in our transparent career model. This is why we work together to plan the steps of your professional development at kumkeo in a focused way when you join our team. We offer customized further training and qualification measures to ensure that our team has the knowledge, skills and latest technologies we need to meet the ever-growing challenges of our industry. We develop vertical and horizontal lines of development step by step, giving you valuable flexibility in shaping your professional future. Process bundles the areas of Sales, Human Resources, Controlling and Marketing, along with other tasks linked to these fields. 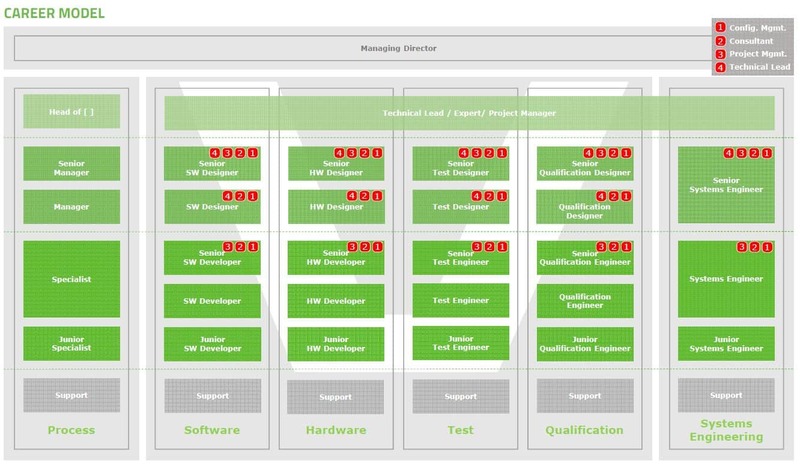 In the areas of Software, Hardware, Test and Qualification, you’ll help implement innovative development projects that represent our core business. Systems Engineering covers the roles involved with the interdisciplinary design of complex systems. In addition to these vertically structured positions, we need talented employees to take on special, project-specific roles in the areas of Configuration Management and Project Management, and also as a Consultant or Technical Lead.